Comics are a visual medium, but so often criticism of the medium hinges on narrative, ignoring or minimizing the visual storytelling and unique structures that make comics so different from cinema and photography. We’ve decided to change that up with a feature in Loser City that we’re calling anatomy of a page, in which we explore pages and panels that showcase the language of comics and how the best visual storytellers maximize the freedom of comics in order to tell stories that can’t be told anywhere else. Today we’re looking back at Kazuo Koike and Goseki Kojima’s masterpiece Lone Wolf and Cub, which is available from Dark Horse. Relatively early on in Kazuo Koike and Goseki Kojima’s epic classic Lone Wolf and Cub, Daigoro, the titular cub, is given the choice between following his father Ogami on his assassin’s road or staying innocent forever by death at his father’s hand. The choice is presented to him through the presentation of a dotanuki, an assassin’s sword, or a child’s ball. Daigoro is of course too young to realize what he is being offered, but he nonetheless chooses the blade and thus is fated to follow in his father’s footsteps. Fate in general plays a big role in Lone Wolf and Cub, but Koike and Kojima return frequently to Daigoro’s fate in particular, with sequences showing the innocence he still possesses set against sequences where he already displays the cunning and strength possessed by his father. One of the most striking scenes showcasing that dichotomy is in “Half Mat, One Mat, A Fistful of Rice,” the story that closes out the first Dark Horse omnibus. 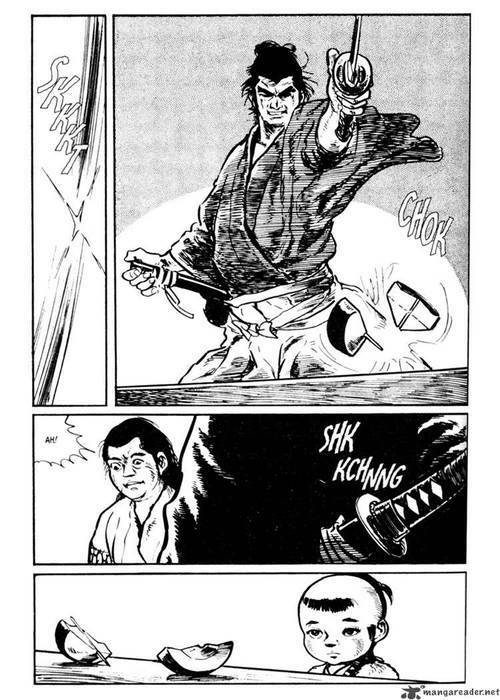 “Fistful of Rice” focuses on a meeting between Lone Wolf and Cub and “Headless Sakon,” another ronin who has deviated from his destiny and now gets by through what is essentially a carnival act. Sakon crouches underneath a table to make himself appear to be just a head and lets people attempt to kill him with swords and hammers and other weapons. When Lone Wolf and Cub witness his show, the act goes wrong and a flying hammer nearly hits Daigoro before Ogami slices it in half. Sakon insists on buying drinks for them as an apology, and while he and Ogami talk shop, Daigoro becomes entranced by a spinning top. Sakon offers to show Daigoro how the top works, which functions as evidence of how innocent Daigoro still is in some ways. But in the next page, Ogami slices the still spinning top in half, in a beautifully illustrated four panel sequence, beginning with Kojima’s reveal of Ogima’s unsheathed blade, which then moves to the blade cutting through its target to Sakon’s horrified expression to Daigoro’s look of stoic resignation. There is no dialogue, the only sounds come from the unsheathing of the blade and its impact which cause Sakon’s non-verbal reaction. Kojima’s work on Lone Wolf and Cub is highly influential for a lot of reasons— the phenomenal detail in his backgrounds, his ability to perfectly render human expressions, the expressiveness of his shading— but his grasping of movement in comic art is almost without peer, though everyone from Frank Miller to Paul Pope have attempted to work it into their own styles. Miller’s Daredevil and Ronin work especially show the influence of Kojima’s kinetic action, but an element that his followers often fail to accurately mimic is his aptitude for simultaneously depicting absolute stillness and acceleration. This may seem contradictory, but this page in particular showcases that ability: sword unsheathed while nothing else moves, the top still spinning despite being in two halves while Ogami remains perfectly static, culminating in the top and Daigoro both stuck in time, focused on the moment. It’s a comic art trick that other media can’t really replicate, though the rotating still frames that were en vogue in film and music videos for a while a few years back function as a cheap version of this style. Masters of comic art like Kojima understand that as important as movement is to comics— or at least the illusion and communication of movement— it’s the still moments that stick with readers, lingering in their brains long after the thrill of a fight or escape has worn off.